Thinking about moving but don’t know where? Ever wonder what your neighbors think of living in your area? 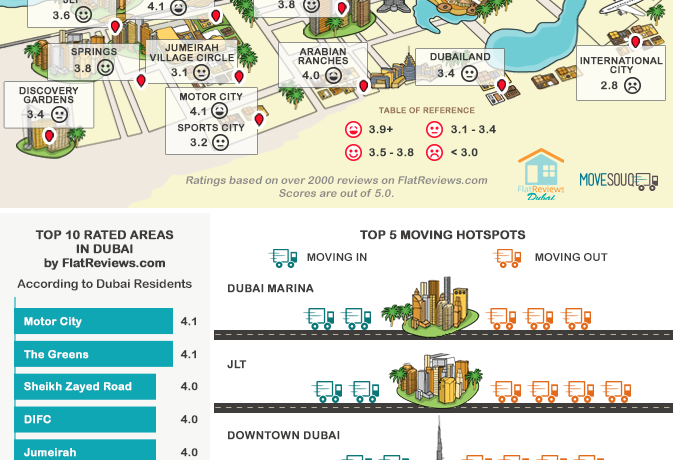 MoveSouq.com and FlatReviews.com have worked together to find out the top rated areas in Dubai according to you! Based on over 2000 reviews left on FlatReviews.com by residents about properties in Dubai, here are the top 10 rated areas! The report also looked at moving trends in Q1 of 2015 to determine what the new hotspots are this year. Dubai Marina retained its spot at number 1, with a 10% moving-in rate and a 15% moving-out rate. JLT placed second with a 4% moving-in rate and an 8% moving-out rate – that means twice as many people are leaving JLT than moving into it! Newcomer, Dubailand, made the list at number 4 after Downtown Dubai, with a whopping 7% move-in rate and a mere 3% move-out rate.